This was an article published about me in the Edmond Sun newspaper on 5-22-2018. Andrea Moon has been offering advice and supplements on natural health, wellness and nutrition at Green Rose Health for the last year and a half. Colorful paintings of animals are scattered on the walls, and supplements and herbs line the shelves of Green Rose Health and Wellness store. 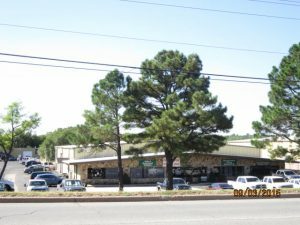 These are accompanied by advice and knowledge on natural health which community members receive at the business located at 3720 E 2nd St, Edmond. For more than two decades owner and wellness consultant Andrea Moon worked in the corporate world as a computer programmer but eventually realized her true passion. “I was a programmer for 26 years and I decided to change my career and I was always fascinated with health,” Moon said. Her new career began as she had meetings with a naturopathic consultant at her husband’s work who educated her on the art of natural health and wellness. “I was fascinated with him and over the course of a couple of years I questioned him and found out about the schools and decided that’s what I wanted to do,” Moon said. Upon making her choice, Moon said she attended Trinity College of Natural Health in which she received a Doctorate of Naturopathy in 2008 and a Master Herbalist degree in 2010. “I quit my full time job in 2011 and discovered that natural health is very similar to being a programmer. Everything is a process and there are steps to natural health just like there are steps to being a programmer,” Moon said. Being a naturopathic doctor is similar to being a teacher, Moon said, because naturopaths educate people on health and wellness. “I do consultations, supplements, Reams testing, muscle response testing, emotional freedom technique. I do pet herbs and health,” Moon said. In addition to these services Green Rose Health offers products including Oklahoma-based cannabidiol (CBD) oil, Colorado Hemp Oil, Natural Sunshine products and local art for visual pleasure. “What I do is like maintenance. Like changing the oil in your car and I help you maintain your body,” Moon said. As well as being a naturopathic consultant, Moon is a Certified Natural Health Practitioner. This means she is licensed and trained to provide advice on natural nutrition, emotional care, and physical care. Green Rose Health opened a year and a half ago after Moon worked with other naturopathic doctors for three years at Conversations. She said she came up with the name Green Rose Health for the business because her grandmother loved roses and Moon’s favorite color is green. The retail location has provided her with more than just a solid physical foundation. “I feel like I was doing this part time until a year and a half ago when I opened the store and really started doing this full time,” Moon said. 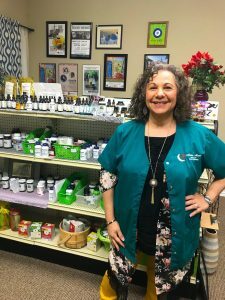 Moon has now lived and worked in Edmond for 45 years and hopes to help more residents with their natural health and wellness. Most of the people who visit her store are looking for ways to become healthier or are already aware of wellness but Moon said she educates them on the three steps to being well. For more information on natural health visit Moon at her Green Rose Health store or visit her website at greenrosehealth.com.